An aging social-housing neighbourhood will receive parks, more inviting streets, and shiny new housing. Proposed rebuild of Alexandra Park, facing north. Image courtesy of Toronto Community Housing Corporation. 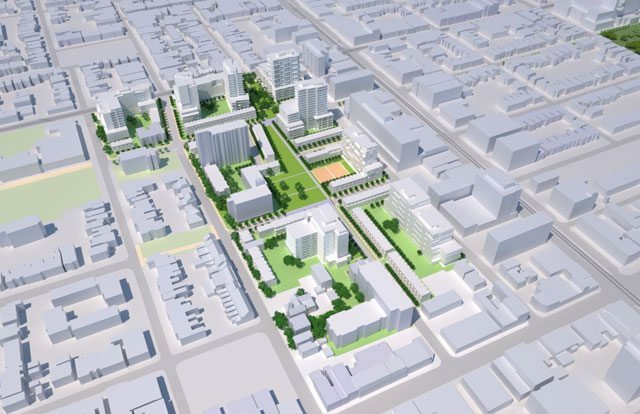 Although talk of expanding public transit in Toronto was the highlight of this week’s city council meeting, the much-needed revitalization of Alexandra Park—an aging social-housing neighbourhood located just south of Kensington Market—was also on the table. And unlike OneCity, it got the go-ahead. The revitalization planning process is already four years in the making: the Toronto Community Housing Corporation (TCHC), along with Councillor Adam Vaughan (Ward 20, Trinity-Spadina), began a consultation process in 2008 with the residents of the 263 townhouses and two apartment buildings (including the Atkinson Housing Co-operative) that constitute this subsidized housing community. A preliminary plan has been developed and re-zoning and Official Plan Amendments have been submitted. The goal is to transition the neighbourhood from one that is predominantly low-income and dominated by social housing, to one that is mixed in terms of both income and use. A four-year planning process may seem like slow going, but it’s fairly typical. 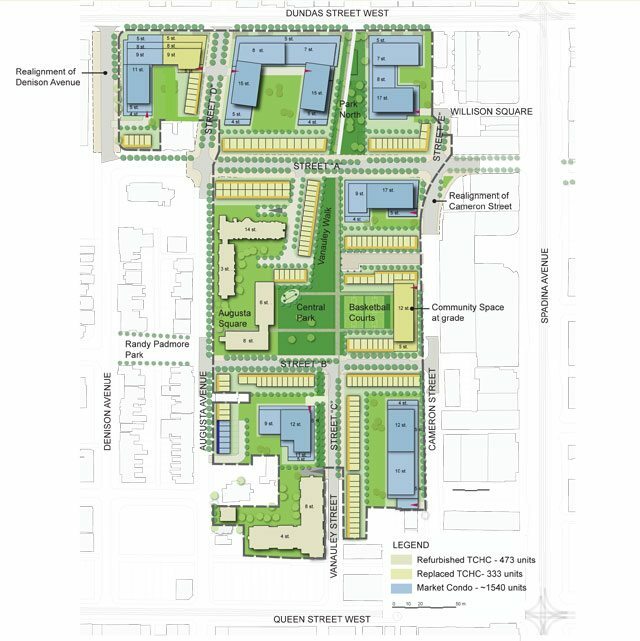 Lawrence Heights, another public-housing neighbourhood, has been mired in the planning process for longer, with less achieved. Council approved the revitalization in principle yesterday and gave the go-ahead for the creation of a plan to assist the community during the area’s transformation. According to Lizette Zuniga, director of development and real estate at TCHC, residents will be working with the housing provider to make sure that the community’s needs, including social service requirements, are met. Alexandra Park Revitalization Master Plan. Image courtesy of Toronto Community Housing Corporation. Retail space will be added at ground level, as well as two new public parks and public streets, which will connect the community to Spadina Avenue and Dundas Street West. The hope is that this will integrate the isolated neighborhood into the surrounding area. Now that city council has given the go-ahead, TCH and development partner Tridel will work with architects and residents to begin designing the new housing. Because the community insisted on no displacement during the revitalization, the process will occur in phases over a period of 12 to 15 years. Vaughan predicted that work will commence within a matter of months. Existing tenants are guaranteed housing in the area during construction. Even those who chose to move off site will have housing upon return. Alexandra Park was built in 1968. A report from last year described the housing as “decaying” and in a “poor state of repair.” Vaughan insisted that the drive behind the revitalization is to create increased opportunities within the community.